Taste: Chocolate overload in the best possible way! 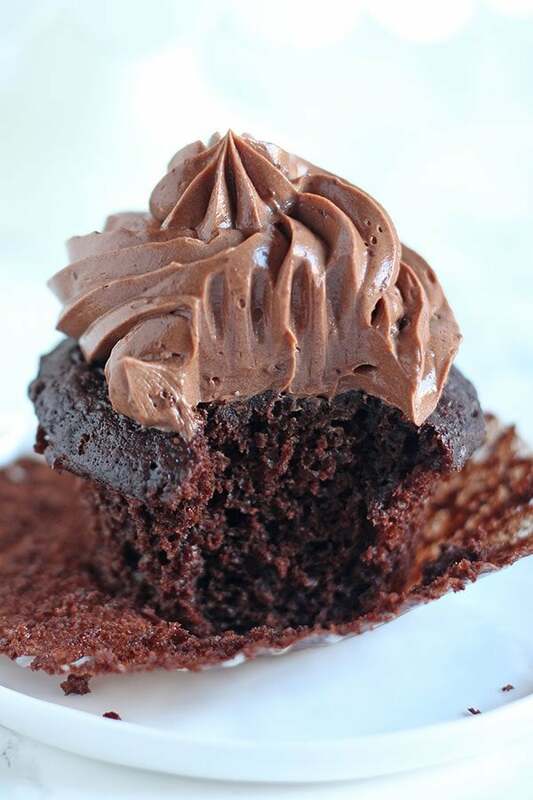 Texture: The cupcakes are incredibly moist and tender without being too delicate or crumbly. And the frosting is just oh so light and creamy. Ease: The cupcakes themselves are super simple and easy, but the frosting is more involved. It balances out in the end! I make this again? Yessss, but maybe not for a while since my kitchen has experienced a cupcake explosion since trying to perfect this recipe, ha! Oh was this a frustrating recipe to perfect. If you follow me at all, then you know I love to utilize the science of baking to tweak and test recipes until I think they’re the ULTIMATE version of that recipe. I’ve done it with my Ultimate Brownies and Ultimate Chocolate Chip Cookies, so it was about time I embarked on another recipe. What better to perfect than Chocolate Cupcakes?! It took about 5 straight batches over a couple days, after previous casual tests over the months, to finally nail the recipe. I hope you love it as much as I do! It’s perfectly moist and tender. Not so moist that is collapses and not so tender that it crumbles. Plus tooooons of chocolate flavor. Like three kinds overall! This recipe underwent extensive testing to perfect. Below is a complete explanation of every major element in case you wanted to learn more about the science and process behind all of it. I’ve tried to answer any questions you might have below, but feel free to leave a comment with any other questions. ALSO, I ended up writing an entire post about How to Make Perfect Cupcakes HERE you might enjoy. Otherwise, keep scrolling for the full printable recipe. 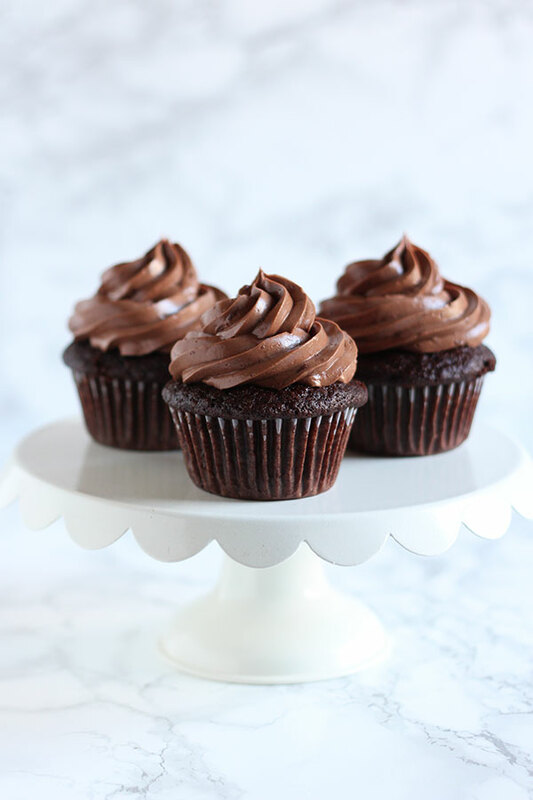 We can’t make stellar chocolate cupcakes without first considering the chocolate! The cupcakes themselves use a whole 4 ounces of bittersweet chocolate AND Dutch-process cocoa powder for as much chocolate flavor as possible. I do recommend you stick with the Dutch-process cocoa as it actually works differently on a chemical level compared to regular natural cocoa. You can learn more about the differences between cocoa powders here. You can find it at many gourmet food stores, like Whole Foods, Sur la Table, and Williams-Sonoma. I actually order a big container on Amazon because it’s such a great value! The frosting uses melted chocolate for the most intense and pure chocolate flavor possible. I like to use semisweet, but feel free to use milk or dark chocolate. It’s totally up to you! This recipe calls for vegetable oil instead of melted butter. I went back and forth on this for a bit and wound up choosing the oil because it creates an ultra moist texture and open, slightly spongy crumb which is perfect for chocolate cupcakes. Feel free to use melted coconut oil instead of vegetable oil! If you bake chocolate cake or cupcakes a lot, you’ve probably seen quite a few recipes that utilize hot water or even hot coffee. It helps to dissolve and ‘bloom’ the cocoa powder to bring out as much flavor with as few cocoa lumps as possible. In my Best Chocolate Cupcake recipe, I use a combination of hot water and instant espresso powder. The espresso simply enhances the chocolate flavor without actually being perceptible. Alternatively, you could use hot coffee for the same effect. I never have coffee on hand so for me, espresso powder + hot water is easier and cleaner. Most of my initial recipe tests used only granulated sugar for the cupcakes. Then, I thought I’d try to add in a bit of brown sugar. The resulting cupcakes were flavorful, moist, and slightly chewy. Perfect! The more whole eggs a cake recipe has, the richer it’ll be. I repeated one of my favorite baking tricks and added in an egg yolk. It works beautifully for brownies and cookies, so why not chocolate cupcakes? 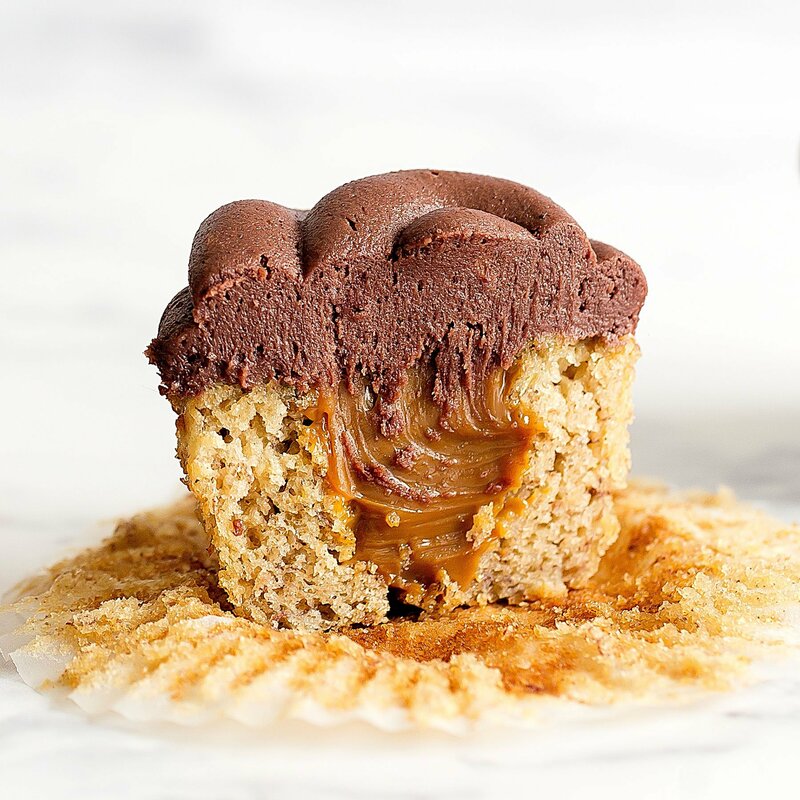 It adds more richness, chewiness, and structure so the cupcake can stand up to a generous or heavy frosting. Oh man, this is where I encountered the most frustration. I went back and forth on this. When I used both baking soda and baking powder, the cupcakes rose to a beautiful height while baking but then fell and collapsed slightly as they cooled. Bummer. That was too much leavener. I went back to only baking soda, which is more effective per teaspoon than baking powder, but had to add vinegar to the recipe. Why? Well because there wasn’t much acid for the baking soda to react with originally. Dutch-process cocoa powder has been neutralized of its acid, so it was only the sour cream and small amount of brown sugar. For tall and light cupcakes, we need enough leavening so baking soda + vinegar did the trick. I tried testing with bread flour after seeing a few ‘ultimate’ recipes that used it but found that all-purpose worked just as well. Since AP flour is more readily available, I stuck with that to make things easiest for you. I find that sour cream adds such a lovely richness and balance of flavor to cupcakes, so I just had to include it here. I think it definitely works best, but full fat plain Greek yogurt also makes a fine substitute. 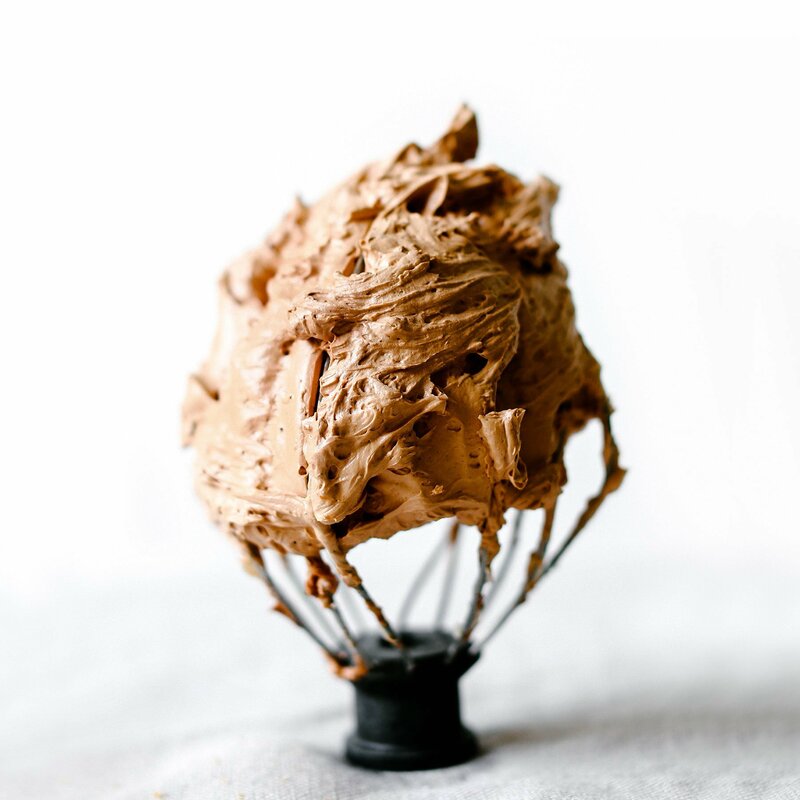 This recipe actually creates a chocolate Swiss Buttercream, which involves cooking egg whites and sugar over a double boiler. Don’t let that intimidate you, I have a full step-by-step video showing you how to make Swiss Buttercream here. Yes, it is extra work. Yes, it is absolutely positively worth it!! Swiss buttercream is sooo much lighter, creamier, and smoother than American buttercream. Plus, it’s not quite so sweet and sugary. However, if you still want to use American buttercream instead here’s a helpful buttercream post. I have my Best Chocolate Cake recipe here that I highly recommend you check out! It’s very similar to this recipe. I used the Ateco #828 piping tip. So decadent. I just love your recipes! Gorgeous photos too. I love love love your ultimate guides/the best ever…recipes!! This recipe looks perfect!! Please please please also do an ultimate guide to vanilla cupcakes and also eggless cake as i am yet to find an awesome recipe and i am sooo in need of one!! 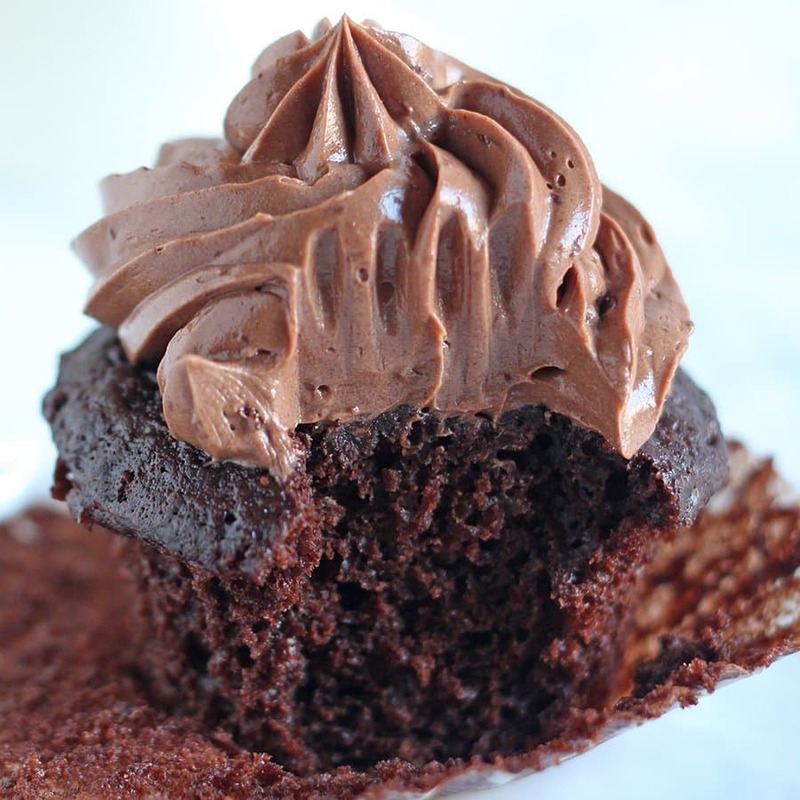 Love chocolate cupcakes! Thank you so much for sharing where to purchase Dutch-process cocoa powder. I have seen that listed on many recipes, but have not found it. Of course, duh, Amazon has everything!! Love the updated look of you site by the way. Thanks Jennifer 🙂 And Amazon Prime is such a lifesaver!! Hi Tessa, I’m wondering if these can be made into cake easily? If so, what would I need to do differently? I’ve only tested this recipe for cupcakes so I wouldn’t feel 100% confident with any instructions for making a cake instead. Let me know if you give it a try! The cupcakes look sooo good…I can’t wait to try your recipe. For the cupcakes you don’t use electric mixer at all? We do not have sour cream in Greece, can I make it somehow? I really want to try them , they look delicious!!! You can use plain yogurt! Hello! Will I be able to use natural cocoa powder instead of Dutch-process? I don’t think it’s easily available in India, where I live. Is there a substitute I can use? Tessa, the cupcakes are the best. I have enjoyed reading your research on not only the cupcakes but the chocolate chip cookies. I’m going to try my hand at the decorating side after I watch your vedio. I made the cupcakes last night and took them over to my best friend. She told me this morning they’re half gone and the best she’s ever had. What adjustments should be made for high altitude? I live at 6,000ft above sea level. Hi Beth! I’m not sure about high altitude. I’ve never lived or baked much above sea level. I will have to say that this truly is the best chocolate cupcake I have made!! Thanks for your work and for sharing this with us! Oh I’m so thrilled to hear that! Thanks, Marcia! I hope it is over! Let me know what you think! Omg It looks sooo good, I would love to try it but I am French and don’t understand anything to cups and ounces is the recipe available with grams measurements ? As I also have tried to perfect my cupcakes I succeded for the frosting part but The muffin in itself I didn’t… Thank you for sharing you hard work, I discovered you through Instagram and subscribed right away, love what you do! These look awesome and i can’t wait to try them!! Best blog ever! I completely take on your advice to use dutch process cocoa and i will be ordering from amazon asap! But as i want to make these now and only have regular cocoa pls advise as to whether i still need the vinegar! Awesome, Aneesa! I would say if you’re going to try regular cocoa to omit the vinegar, but I can’t be 100% sure as I haven’t tried that exactly. Let me know how it turns out! These were terrific!! Probably the best recipe I have found so far. Chocolate cup cakes are my husbands favorite so I make them all the time. Tried this recipe recently and found it to be moist and full of chocolate flavor and held up to the dry climate. Instructions are clear and easy to follow. Thanks so much Tessa! Love your stuff! So happy to hear that, Deborah! Is white vinegar the same as distilled vinegar? Tried this earlier and I was so happy for the result!!! They even ate it after i removed the first batch from the oven.. And because of that, i need to make a second batch!!! But the cupcakes alone are delicious!!! OMG! So yummy! Just finished baking a batch of mini chocolate cupcakes and couldn’t wait until they cooled completely. This is a test run for my son’s birthday party next week and couldn’t be happier. Only substitution was using decaf instant coffee. Will be trying to match the cupcakes with a marshmallow cream cheese frosting tomorrow. Need a white canvas on top for the edible Power Rangers print cupcake toppers. Thank you for the detailed recipe (love the weights) resulting in such a moist chocolatey cupcake! Love your chocolate cupcakes. How about a moist vanilla cupcake. I just can’t find one. I have yet to perfect the vanilla cupcake recipe 🙁 I’ll keep trying though!! If you don’t have sour cream you could substitute with full fat Greek-style yogurt. So, I’m not a baker by any means. Cooking is my game but I had the urge to bake after seeing this recipe. The cake portion turned out perfectly. The cake was moist and not overly sweet. However the icing turned out to be more of a ganache and not really fluffy at all. This could be because I hadn’t melted the chocolate prior or maybe I should’ve refrigerated the icing for an hour or two before icing my cupcakes? After adding the butter to the egg white/sugar mixture it just never got to as fluffy as I had hoped. I feel like maybe the step of having to melt the chocolate beforehand should be in the method rather than listed as an ingredient. Or that the icing should be refrigerated for an hour or two before applying to the cupcakes. I just put the bowl back on the double boiler for a little bit longer so the chocolate could melt properly. I’m sure if I did this recipe over it would turn out beautifully. I’ll definitely try t again someday…. So, my fiance bought groceries for me and instead of buying a bar of bittersweet chocolate, he got bittersweet chocolate chips. Its a 10 oz bag, and I see the recipe needs 4 oz. Do you think half a cup of chocolate chips would work? I don’t have a food scale so I can’t weigh ingredients… you may not answer before I get started, but I figured someone else may need to know later anyway! I’m having a party tomorrow, so I have a lot of baking to get too! 🙂 This is the first time trying one of your recipes, and it looks really good, so hopefully it turns out! Hi Stacy, bittersweet chocolate chips should work fine. 6 ounces of chocolate chips is 1 cup, so a generous 1/2 cup measurement should do the trick. The recipe sounds great but we don’t like cupcakes we like layer cake, can you just use the same recipe? Hello Tessa, this is the best chocolate cupcake I have tried so far in years. Sweetness is just right, texture is smooth and moist and most of all, no caving! Was not able to make the frosting though as the cupcakes were quicky gone before I could even prepare the frosting! Love, love this recipe! Hi! Ok, so these are in the oven now! The batter is awesome, I had pretty high expectations for them, all seemed well. Except for the cocoa powder part! My hubby ran to the store for me and couldn’t find dutch processed, so we used regular. And it wasn’t until now that I saw your suggestion about omitting the vinegar if using regular!!! YIKES! I guess we shall see what happens after these puppies are done. I’ll let you know if it is successful, hoping so, they are for my sons class party…tomorrow! lol. So how’d they turn out?! These were just awesome! Easy to make … made these with my daughter as a mother’s day treat for her mom. Everyone loved them. Thanks for this wonderful recipe, I substituted plain yogurt for sourcream. Hi – I was just wondering if the cupcakes would require to be refrigerated given the sour cream? I want to make these as cupcake jars favors so guests may not refrigerate. I see the frosting calls for egg whites so I’d use a standard buttercream instead since egg whites do require refrigeration. Hi Ashley, actually you wouldn’t need to worry about the sour cream or egg whites spoiling since both those ingredients are cooked to a temperature that kills bacteria. The only perishable ingredient you’d need to worry about is the butter in the frosting, however the sugar helps prohibit bacteria growth so buttercream is fine left at a cool room temperature for the better part of the day. It’s up to you and what you feel safe doing. I typically refrigerate after 8 hours. For a vanilla frosting can I just omit the chocolate or should I also increase the amount of vanilla? A little too much bittersweet chocolate for me, I think I will try semisweet next time instead. I also might try baking powder instead of soda to make them a little more dense, I like them a little less airy. Yummy though, and not overly sweet which I like. Hi, it’s probably the third time I’ve made these chocolate cupcakes with different frostings (of course with your swiss buttercream recipes) and they turn out perfect every single time. Everyone loves them in my house from kids to adults. Thanks for this wonderful delicious super easy cupcake recipe. Hey.tried these today,the frosting turned out super. But something seriously went wrong the cupcakes,the batter overflowed the cups.the cakes smelt bad when baked and they taste very bitter.i made a few changes,can you tell me if this is what went wrong? 2.i didn’t find any step about not using vinegar if using natural cocoa,thus used vinegar twice.once as stated in the recipe and once for the sour cream sub. Is that why they’re so bitter tasting and smelling bad? Hi Ayesha, I’m not quite sure what happened! But I can say this recipe took a looooot of tweaking and testing so following it exactly is your best bet. hi, I would like to triple this recipe, how do I go about doing that? thanks in advance. Thank you so much sharing this wonderful recipe…. I will definitely look one for your baking cookbook!!!! pastry bags or can I use a ziploc with the Ateco tip? Would I fold the plastic bag and then cut the tip, then put the tip on it? Please help. . .thanks. I’d like to try the recipes and use the piping tip. As Aussie here trying to work out ounces into grams. With regards to the Dutch-process cocoa, it seems that 2 tablespoons would equal 1 ounce, however this isn’t sufficient enough to make 1/3 of a cup. Could you please advise in tablespoons the amount of Dutch-process cocoa to use? Ah so happy to hear that!! I’ve actually been thinking about adding a feature to my recipes that would allow anyone to submit their own photos of the recipe. Would you like that feature? Could it be because i doubled the recipe???? Would like to make again but fix the dryness factor. Measured carefully and didn t ovetbeat or overcook!!!! Did you measure by weight or volume? By volume, this recipe doubled should required 1 3/4 cups flour (I know that can be a little confusing). I’ve tested this recipe many times, and based off the positive comments its received I’m thinking it was probably an ingredient that was mis-measured or incorrectly doubled. Hi Tess Yesss please put up the feature where we can upload our pics that used your recipe. I made these today for my daughter’s birthday party and they were sooo delicious! This is going to be my #1 chocolate cupcake recipe from now on! Hi! My husband’s 5 year old niece was in town and her mom told me she really wanted to make chocolate cupcakes with me, and she has never made cupcakes before. I am NOT a baker. I probably bake once a year. But I really wanted to give her an authentic experience instead of using a box, so I searched high and low and settled on your recipe. I just wanted to say THANK YOU. They turned out PERFECT. Everyone loved them. I love that they rose well, were pretty sturdy yet fluffy on the inside, and were not overly sweet. I also missed the part about not using vinegar if using regular cocoa powder but they were still delicious. Will be saving it to my favorite recipes list! Um Tessa, I know we’ve never met so this is a bit weird, but I love you. Like seriously the best baker award should go to you. Forever. I can’t tell you how many scratch cakes/cupcakes I’ve tried over the last couple years. Not a single one has met my expectations… But these little puppies. Yes. They did. Perfectly soft and airy like a boxed mix but with this special almost chewy top. The are nothing short of perfection. I’m smitten. Thank you, thank you for sharing this recipe with the world!!! WOW i made this icing (with white chocolate) and the chocolate cake from your chocolate mint cupcake and it was so perfect! I had put oreos on top because it was an oreo cake and it was so delicious! best chocolate cupcakes i have made!! and we try so many recipes because we love chocolate lol. we dont have bittersweet choc in australia so i used good quality dark choc and still they are so so good. i always make smb with cakes & it goes so perfect together! thanks tessa. Hello, Jessa! These cupcakes look so good!!!! I’m planning on making these today for Eid. I hope mine turn out as good as yours look! But for bittersweet chocolate, can I add dark or semisweet chocolate chips or what exactly because I’m confused. Eid Mubarak, Huda! Yes you can use the same amount of semisweet chocolate in place of the bittersweet. The cupcakes will just be slightly sweeter! hi tessa! can i use this cupcake recipe for fondant themed cupcakes without the chocolate buttercream? will these stay moist at room temperature if i make them ahead 2 days before delivery date or should i put them in the fridge? Hi. Just made these last night for a party today. Party has been cancelled indefinitely due to a family emergency. I’m wondering if these can be frozen, and for how long? They are unfrosted, as I was called away after making the frosting. Hi Tari, I hope everything is okay! These cupcakes will last unfrosted frozen in an airtight container for about 4-6 weeks. Thanks, Tessa. Medical issue is better!! Many thanks for the “skip to the recipe” button! I can’t remember the last time I came across a recipe on a blog that didn’t make me scroll through a million photos to get to the recipe. Bless your beautiful soul. Hi Tessa, You def. were not kidding with best chocolate cupcakes. I gave a few different recipes this week getting ready for my daughters first birthday and this was one of everyone’s favorite pick. My own issue was not sweet enough giving a bit of that bitter taste….So I wonder would the semi sweet change anything other then giving it a little more sweetness? FYI, for those not able to find Dutch processed cocoa powder, I just picked up a bag at Costco. I’m so excited to be baking these today to make Frankenstein cupcakes with for our Halloween potluck at work tomorrow! The sour cream here isn’t labeled like that, I just used standard full fat sour cream! These look delicious. My 7 year old would like chocolate cupcakes for his birthday-can I leave out the espresso? Thank you! I was just wondering if special dark would work it’s a mix of natural cocoa and dutched cocoa? I think that’ll work, but I’ve never used it so I’m not completely sure. Let me know how it turns out if you give it a shot! Have you ever made these ahead of time and frozen? Wondering if freezing for a week and defrosting would affect anything? Thanks! I made these for a party and they were a huge hit, but for a bigger group I need to make a larger batch. I read in one of your comments that this recipe doubles well. Is the recipe the same (each ingredient doubled in volume, i.e. 3/4 c = 1.5 c) when doubled or do I need to tweak some of the measurements? Thanks! Hi, I want to make these cupcakes but I’m confused with the cup to ounces conversations. It’s says 1/3c of cocoa, but list (1 ounce). However 1/3c equals 2.6 ounces. So am I just to follow cup measurements? I want to Make sure I get it right ! Can I freeze it? if so does it still good taste? Yes, the unfrosted cupcakes freeze beautifully. I just made this cupcake and it is cooling down right now. Looks good thought.. What is your favorite AP flour? Thanks. Hi, this is by far the best chocolate cupcake/cake I ever ate!!! I would like to know if you have a vanilla cake recipe as good or if it’s possible to do this recipe without chocolate and coffee? Hey, I’m planning to try this out tomorrow! I have a question. Normally, when my chocolate mixes with water, it hardens and I cant use it further. But you have mentioned pouring hot water over the chocolate! Is there some other reason? Hi Tessa. I have one question. Have you ever tried making these with cake flour? If so, whats your take on it. I made the cupcakes and they are just wonderful. Made the second batch with semi-sweet chocolate instead, perfer it more over the bitter one. However, this recipe is a keeper for sure. 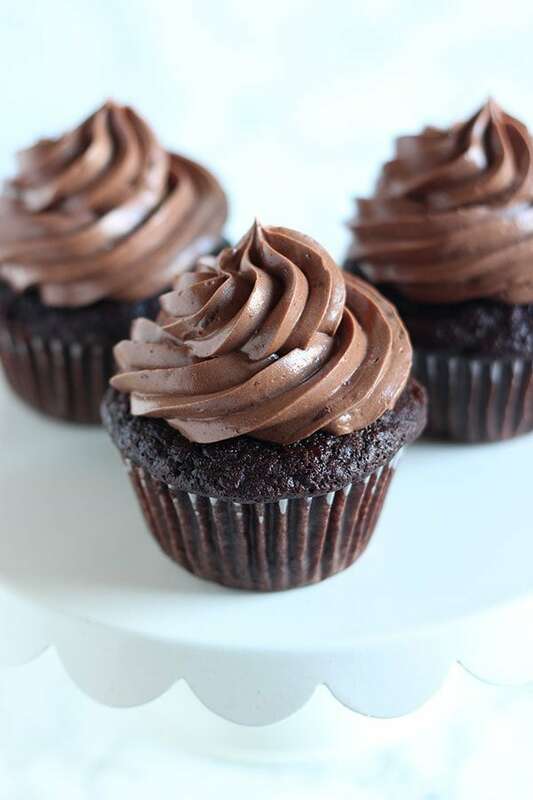 The go-to chocolate cupcake recipe. So thank you a tons for ending my search for the ultimate chocolate cupcake wohoooo. Tired of people claming “theirs” is the best one ever. No no no YOURS IS. I baked two dozen chocolate cupcakes and made 1 1/2 times frosting recipe. Does it enough frosting? Hi Tessa. I wanted to ask what is the replacement of sour cream as I can’t find sour cream in my market. Hi Tessa.. I will be using a convection microwave .. So are the setting like the temp and timing gonna remain the same? AMAZING, These cupcakes were light, crumbly, chocolatey with the craziest chocolate frosting I have ever had! A must do again recipe! Love your recipes. I looked at the Ultimate Cookie Book and I am not sure if it was $39.00. Are these books hard cover or sent over the web? Is there just one cookbook with all of the Ultimate series? Tessa, this is the absolute best frosting I have ever had or made. Thank you. In my opinion, _this_ is the ultimate buttercream frosting, not the American one in your other guide. The American buttercream is like whipped cream, but this buttercream doesn’t have that atrocious texture: it has an amazing texture! In the last batch of these cupcakes I made, I added peanut butter chips to the batter before baking. They were to die for. I highly recommend this customization! I LOVE these cupcakes! However I could NOT get the frosting to thicken up for the life of me :/ Any thoughts as to what I did wrong?? Hi all the way from Cape Town, South Africa. Thank you so much for all the testing to bring us the perfect recipe. We couldn’t do baking life without people like you. May i request that you format your recipe to be more universal friendly? It’s always a mission to convert measurements. Looking forward to baking these soon. An amazing cupcake recipe. I made these GF using Bob’s Red Mill 1:1 instead of AP flour, and they turned out fantastic! Paired them with a cream cheese/grapefruit frosting in lieu of the chocolate buttercream and was very happy with the results! Thanks for all of the research you did to make this recipe so incredible!!! I just recently made these cupcakes and I had high hopes for them. I have a go to chocolate cake recipe that I usually use but I was looking for something that domed a bit more so I gave these a try. I am a very experienced baker and even thought they smelled delicious they came out extremely dry for me. I followed the recipe exactly but I just didn’t like the outcome. I even baked the second batch I made for a shorter time hoping that would help but they were still not up to my standards. I may attempt them again with a minor adjustment to the kind of chocolate I use and see if that makes a difference. Do you also have a chocolate cake recipe. 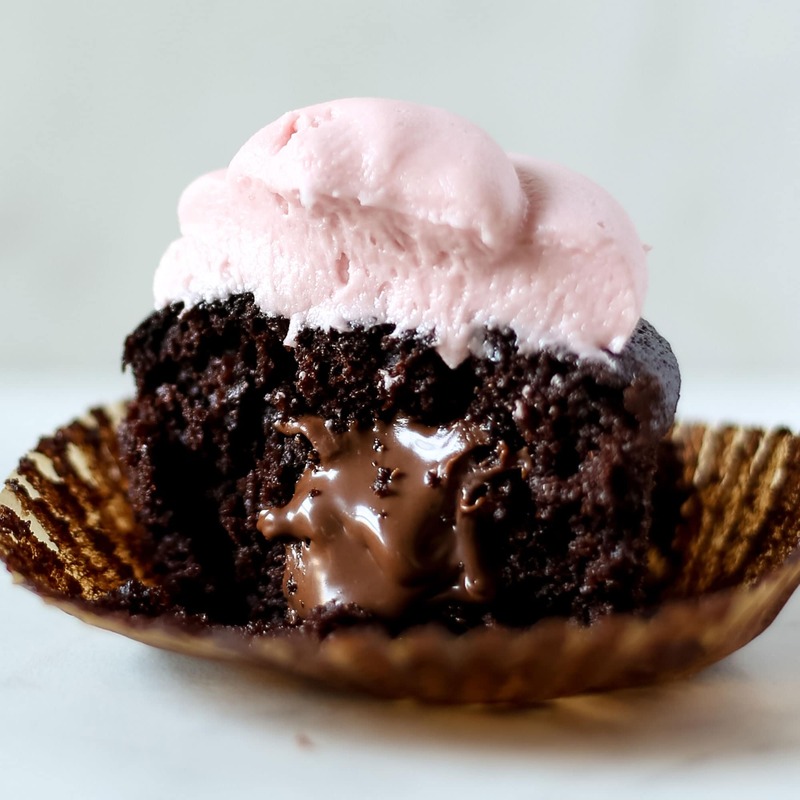 We have made your chocolate raspberry cupcakes and people ask for them over and over again. I”m just not sure how to make the transition from cupcake to cake and we would need to double layer. I feel nervous making any changes. Thanks for any advice. Your cupcake is beautiful as you .. If substituting buttermilk for sour cream, what would the amount be? Best in the World! Just baked with my 12 yo. She’s addicted to it! Thank you. OMG-Truly THE BEST CHOCOLATE CUPCAKES EVER!!! It’s my go to recipe now. I have recveived RAVE reviews from family & friends…I’m known as the cupcake chick too. I stuff them with a whip cream ganache and call the triple chocolate wonders. Thanks sooo much! Hello Tessa! What do I melt the chocolate with for the frosting situation? Is it with butter or just the chocolate? Finally! I’ve had a chocolate cake recipe (similar to yours, actually) that I’ve loved for years, but it doesn’t translate to cupcakes well at all. This recipe is perfect! Such lovely crowns, perfect for frosting! Thank you so much! These are phenomenal! I am a novice baker and this recipe was easy to follow and worth every calorie! I didn’t use the buttercream recipe, as the friend I made them for wanted American buttercream, but the cupcake was easily the best chocolate cupcake I have ever had! Thanks also for putting your ingredients in grams! AMAZING! I have NEVER made such excellent chocolate cupcakes in my life and the Italian chocolate buttercream is even more remarkable. I wish there was a way to show you how beautifully they came out. Thank you. I’ll now be subscribing to any and all classes you offer!